Carole reviewed this movie first and recommended it on her blog, Carole Rae’s Random Ramblings – thank you girl, you rock! Haven’t I told you in my comment I was sold instantly? 😀 Here is the proof that I was serious. 1976, Mount Waverley, Australia. Eight-year-old, Mary Daisy Dinkle is ugly, poor and lonely. At school, she is teased by her classmates because, apart from being fat, she has an unfortunate, poo-coloured birthmark on her forehead and mud-colored eyes; at home, her distant father, Noel, and alcoholic, kleptomaniac mother, Vera, provide little support if any support at all. Her only comforts are her pet rooster, Ethel (! ), sweetened condensed milk, chocolate and a Smurfs-like cartoon show, The Noblets. One day, while at the post office with her mother, Mary spots a New York City telephone book. Being a curious child she wants to know more about Americans so she decides to write to one. She randomly chooses Max Jerry Horowitz and writes him a letter; she sends it off with a bar of chocolate in the hope that he will become her pen friend. She couldn’t have chosen better. Or worse. Max is as different from Mary as it is only possible – he is a morbidly obese 44-year-old Jewish atheist living alone with a cat, a parrot and a string of gold fishes called always Henry. He has trouble forming close bonds with other people due to various mental and social problems. Though Mary’s letter initially gives him an anxiety attack, he decides to write her back, and the two quickly become friends (partly due to their honesty, curiosity, shared love of chocolate and The Noblets). When in one letter Mary asks Max about his love life (you know those kids, curious like cats), he suffers a severe collapse and is institutionalized for eight months. After his release, he is hesitant to write to Mary again for some time. On his 48th birthday, he wins the New York lottery, using his winnings to buy a lifetime supply of chocolate and an entire collection of Noblet figurines. Meanwhile, Mary manages to get married, graduate from a local uni, get divorced. Her psychology degree thesis is about Max but he doesn’t appreciate it at all and, in a form of a protest, he sends Mary the M letter pulled from his writing machine. After that Mary has a major crisis – she starts drinking heavily like her old, dear mum and becomes despondent, thinking Max has abandoned her. Will their friendship survive this time? It is a delightful movie about people who are usually ridiculed and ostracized in the society – uglies, fattos, nutters, alkies, beggars, trailer trash. It is a drama as well – don’t expect a happy ending or anything overly happy in between. 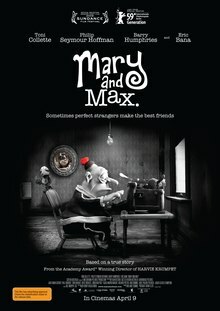 Both Mary and Max are very unlikely leads. She is an insecure child from a dysfunctional family. He is an orphaned man with Asperger’s who fails to understand people and communicate with them. Overall it is a very odd, very unlikely animated film from Australia that manages to be sickly-cute, alarmingly grotesque, and right-on at the same time – often in the very same scene. Small wonder I enjoyed it enormously. Young Mary – an unhappy kid with a poo-coloured birthmark. I loved the subtlety of the characterization, employed by the director. I loved how money was never able to solve any of Mary’s or Max’s problems, more often than not creating new issues. I loved the sense of humour, very dark humour but still, permeating the narration. I appreciated that the director tried to keep the story as close to real life as possible. All of this is rendered in almost completely monochromatic clay animation making me think of Wallace and Grommit. Every character was lovely crafted and distinctive, sometimes very funny or very ugly or both. Max and his one-eyed cat pet, rescued on the street. 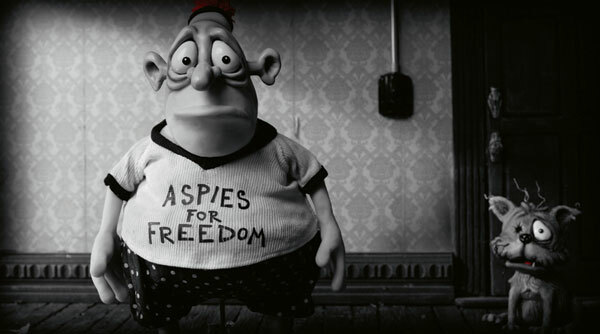 Mary and Max isn’t exactly a kids film, although it’s exactly the kind of film I would like intelligent kids to watch. There is plenty of gross stuff that they will love: Max collects his toenail clippings in jars labelled by year and the fates of some of his gold fishes are unusual to say the least of it. Still the 12A certificate is about right, taking into account rutting dogs, death by accidental embalming and electric-shock therapy. Still, above it all ‘Mary and Max’ is a moving celebration of oddness and friendship. Which is simply great. Funny, intelligent, original. More films like this please, animated or otherwise. This entry was posted in cartoon based comedy adventure, movie review and tagged cartoon movie, dark humour, funny, great narration, great plot, interesting characters, Mary and Max, not Disney, watch it what are you waiting for. Bookmark the permalink. Argh. Stupid iPad. Sounds so sweet and cute! I do recommend it to you wholeheartedly, Tasha. It is sweet and cute but never cloying. It’s dark but with rays of sunshine from time to time. And it’s incredibly funny. Wow, sounds like a very interesting movie. I’m not in for “no happy endings” at the moment, but will (try to) remember the title for later. The ending of this one is not exactly happy but I wouldn’t call it completely pessimistic either. Something in-between, like the whole movie. I am glad you reviewed it in the first place! Thank you once again! I am going to have to track this one down. It looks really good. It is very good and I recommend it to you wholeheartedly.